A new version of Ariba integration with SAP Business Suite is available now, extending Ariba Sourcing and Ariba Collaborative Supply Chain. Well-established SAP best practices for highly automated network-integrated procurement processes have further been improved. Once again, this content is free of charge for SAP customers, and can be accessed and downloaded from SAP Service Marketplace at https://rapid.sap.com/bp/RDS_ARI. 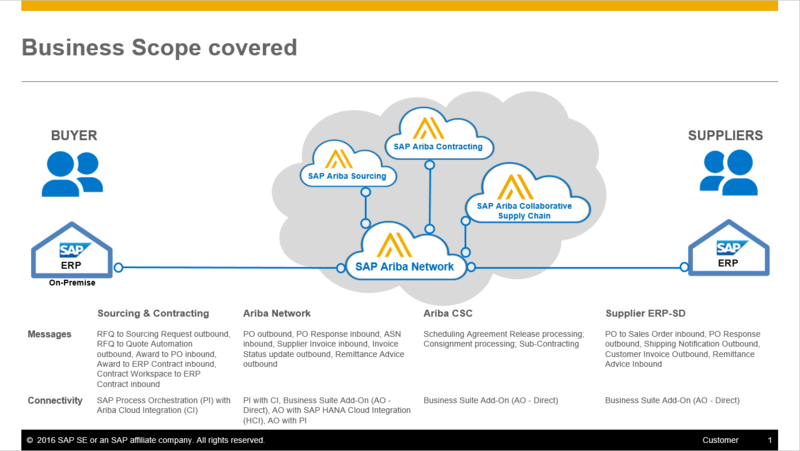 Based on the guidance of that content, SAP customers are empowered to connect their SAP ERP with SAP Ariba on their own or with a partner. For those customers who would like to take advantage of SAP Ariba’s experience, SAP is offering a service to implement the standardized scope of the rapid-deployment solution within 5 weeks for a very competitive price. This solution covers the integration between SAP Business Suite and SAP Ariba to support procurement processes. For suppliers, the scope includes the integration of SAP ERP Sales and Distribution with the Ariba Network, automating the creation of sales orders from incoming purchase orders and the sending of invoices to buyers. We are now also providing an useful guide for analyzing and resolving issues in integrated business scenarios. A big percentage of all errors are caused by the fact that the system was not properly configured. You will find the guide in the attachments of this SAP Note 2334863. For RDS content please contact karsten.manske@sap.com. I could not find the note 2334863 in SAP support portal. It says the note has been removed from the portal. Please help.